Joseph ben Caiaphas (c.14 BCE – c.46 CE) known simply as Caiaphas (Hebrew: יוֹסֵף בַּר קַיָּפָא; Greek: Καϊάφας) in the New Testament, was the Jewish high priest who, according to the gospels, organized a plot to kill Jesus. He famously presided over the Sanhedrin trial of Jesus. The primary sources for Caiaphas' life are the New Testament and the writings of Josephus. Outside of his interactions with Jesus, little else is known about his tenure as high priest. The 1st-century Jewish historian Josephus is considered the most reliable extra-biblical literary source for Caiaphas. His works contain information on the dates for Caiaphas' tenure of the high priesthood, along with reports on other high priests, and also help to establish a coherent description of the responsibilities of the high-priestly office. Josephus (Antiquitates Judaicae 18.33-35) relates that Caiaphas became a high priest during a turbulent period. He also states that the proconsul Vitellius deposed his father in law, Annas. (Antiquitates Judaicae 18.95-97). Josephus' account is based on an older source in which incumbents of the high priesthood were listed chronologically. In June 2011, archaeologists from Bar-Ilan University and Tel Aviv University announced the recovery of a stolen ossuary, plundered from a tomb in the Valley of Elah. The Israel Antiquities Authority declared it authentic, and expressed regret that it could not be studied in situ. It is inscribed with the text: "Miriam, daughter of Yeshua, son of Caiaphas, Priest of Ma’aziah from Beth ‘Imri". Based on it, Caiaphas can be assigned to the priestly course of Ma’aziah, instituted by king David. Annas, father-in-law of Caiaphas (John 18:13), had been high-priest from A.D. 6 to 15, and continued to exercise a significant influence over Jewish affairs. Annas and Caiaphas may have sympathized with the Sadducees, a religious movement in Judaea that found most of its members among the wealthy Jewish elite. The comparatively long eighteen-year tenure of Caiaphas suggests he had a good working relationship with the Roman authorities. In the Gospel of John 11, the high priests call a gathering of the Sanhedrin in reaction to the raising of Lazarus. 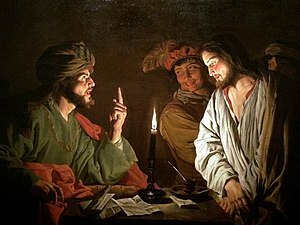 In the parable related in the Gospel of Luke 16:28-30 the likely reaction of the "five brothers" to the possibility of the return of the beggar Lazarus has given rise to the suggestion by Claude-Joseph Drioux and others that the "rich man" is itself an attack on Caiaphas, his father-in-law, and his five brothers-in-law. Afterward, Jesus is taken to Pontius Pilate, the Roman governor of Judea. Pilate tells the priests to judge Jesus themselves, to which they respond they lack authority to do so. 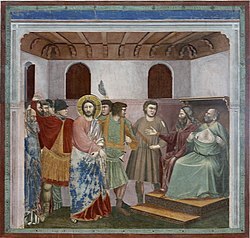 Pilate questions Jesus, after which he states, "I find no basis for a charge against him." Pilate then offers the gathered crowd the choice of one prisoner to release — said to be a Passover tradition — and they choose a criminal named Barabbas instead of Jesus. In Inferno, Dante Alighieri places Caiaphas in the sixth realm of the eighth circle of Hell, where hypocrites are punished in the afterlife. His punishment is to be eternally crucified across the hypocrites' path, who eternally step on him. Caiaphas is mentioned throughout the works of William Blake as a byword for a traitor or Pharisee. Caiaphas and his ossuary are the subjects of Bob Hostetler's novel, The Bone Box (2008). Actors who have portrayed Caiaphas include Rudolph Schildkraut in Cecil B. DeMille's film King of Kings (1927), Guy Rolfe in Nicholas Ray's film King of Kings (1961), Rodolfo Wilcock in Pier Paolo Pasolini's film The Gospel According to St. Matthew (1964), Martin Landau in George Stevens' film The Greatest Story Ever Told (1965), Bob Bingham in Norman Jewison's film Jesus Christ Superstar (1973), Anthony Quinn in Franco Zeffirelli's television miniseries Jesus of Nazareth (1977), David Schofield in The Miracle Maker (2000), Mattia Sbragia in Mel Gibson's film The Passion of the Christ (2004), Bernard Hepton in Son of Man, Adrian Schiller in the TV miniseries The Bible (2013) and the film Son of God (2014), both by same production team, and Richard Coyle in A.D. The Bible Continues, an NBC miniseries by Mark Burnett and Roma Downey. ^ a b c d Metzger, Bruce M.; Coogan, Michael, eds. (1993). Oxford Companion to the Bible. Oxford, England: Oxford University Press. p. 97. ISBN 978-0195046458. ^ Bond, Caiaphas, p. 86. ^ Josephus' source is mentioned in Antiquitates Judaicae 20.224-51 and Against Apion 1.36; see Bond, Caiaphas, p. 163, n. 2. ^ Specter, Michael (August 14, 1992). "Tomb May Hold the Bones Of Priest Who Judged Jesus". The New York Times. New York City: New York Times Company. Retrieved January 11, 2019. ^ a b Charlesworth, James H. (2006). Jesus and archaeology. Grand Rapids, Michigan: William B. Eerdmans Publishing. pp. 323–329. ISBN 978-0802848802. ^ Bond, Helen Katharine (2004). Caiaphas: friend of Rome and judge of Jesus?. Louisville, Kentucky: Westminster/John Knox Press. pp. 4–8. ISBN 978-0-664-22332-8. ^ CNN Wire Staff (2011-06-30). "Israeli authorities: 2,000-year-old burial box is the real deal". CNN. Retrieved 2011-08-26. ^ Reilly, Wendell (31 March 2017) . "Joseph Caiphas". The Catholic Encyclopedia. 3. New York City: Robert Appleton Company. ^ Vanderkam, James (2004). From Joshua to Caiaphas: High Priests after the Exile. Minneapolis, Minnesota: Augsburg Fortress Publishers. p. 426. ISBN 978-0800626174. ^ Gottheil, Richard; Krauss, Samuel. "Caiaphas". 1906 Jewish Encyclopedia. Jewish Encyclopedia. Retrieved 11 January 2019. ^ For a discussion of Tosefta Yevamot 1.10 and other possible rabbinic references, see Bond, Caiaphas, p. 164, n. 3. ^ Falk, Harvey (1985). Jesus the Pharisee: a new look at the Jewishness of Jesus. Eugene, Oregon: Wipf & Stock. p. 137. ISBN 978-1592443130. ^ Hostetler, Bob (2008). The Bone Box. Brentwood, Tennessee: Howard Books. ASIN B0063KB2OO. This article incorporates text from a publication now in the public domain: Herbermann, Charles, ed. (1913). "Joseph Caiphas". Catholic Encyclopedia. New York: Robert Appleton.